The Aviva Tour of Britain is an unpredictable event that suits "the most tenacious" riders, says 1992 Olympic gold medallist Chris Boardman. 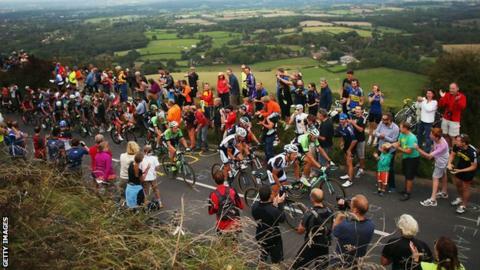 The eight-stage race gets under way in Anglesey on Sunday and finishes in London on 13 September. Sir Bradley Wiggins and fellow Briton Mark Cavendish are both taking part. "The one thing we've come to learn is you just don't know what's going to happen in this race," said Boardman, who is an ambassador for the Tour. "You get home riders, people trying to make their name, people coming back from injury, people building up for the worlds, people winding down. It's such a mix. "It's more who is the most tenacious who tends to win, not who is the best on that climb there. You can't pinpoint where it's going to happen. That makes good viewing." Britain's two-time Tour de France champion Chris Froome and fellow Team Sky rider Geraint Thomas will not be appearing because they have been involved in the Vuelta a Espana. However, former winner Wiggins will lead his own Team Wiggins, who are competing for the first time, while sprinter Cavendish heads a strong Etixx-Quick Step line-up. Tao Geoghegan Hart, Hugh Carthy and Alex Peters are in the British Cycling team, along with academy riders Scott Davies, Gabz Cullaigh and Ollie Wood. Team Sky are represented by four British riders - Ben Swift, Peter Kennaugh, Ian Stannard and Andrew Fenn. Their line-up also includes Italian Elia Viviani and Dutchman Wout Poels. The modern Tour of Britain, in its 12th year having returned to the calendar in 2004 after a five-year absence, starts in Beaumaris on Anglesey - the first time the race has begun in Wales. From there it takes in Colne, Edinburgh, Blyth, Stoke, Fakenham and Ipswich before ending on Regent Street in London, covering a total distance of 1,443.6km. The 177.7km first stage is expected to end in a sprint finish, which would suit Cavendish. The second stage - from Clitheroe to Colne and measuring 159.3km - could be pivotal, according to Boardman, who won individual pursuit gold at the Barcelona Olympics in 1992. "The winner will probably come from a breakaway that goes away at some unspecified point, even as early as stage two because round Clitheroe it's pretty nasty," he said.